The Rabbit Sheep relationship share many things in common. Their personalities are similar and so are their outlook on life. Both these Chinese zodiac signs have an affinity for the arts and the beauty in the world, which is something they can easily share with each other. The rabbit and goat soulmates have no qualms about being homebodies. They both relish in the security and comfort of their homes, although the rabbit may get the social itch a little more than the goat. The key to the excellent love compatibility in a Chinese zodiac Rabbit Sheep pairing is finding a partner who has the same interests. They can easily understand each other emotionally, much better than many other signs, and they have comparable perceptions about life. The goat will need to be able to rely on the rabbit man or rabbit woman, as he or she can easily become stressed and scattered, not knowing how to manage his or her many creative talents. Yet considering the natural connection between the two, the rabbit will most likely know how to handle it, especially since they are excellent listeners. The sheep man of sheep woman also needs constant approval and appreciation – something the rabbit is more than adept at giving. Still, they must be careful at not becoming too consumed in each other’s moods, because this without the proper communication can cause serious problems for a Sheep Rabbit marriage. That being said, both of these Chinese signs must have peace to function. Without harmony and balance, both are a mess, as if they can’t move forward in life. In this way, the goat male and rabbit female can understand each other. Although they may not be able to help the other push through, at the very least, they can commiserate together. They can also work together to create a harmonious home environment, one that breeds tranquility and solitude. The Rabbit and Sheep in love also avoid conflict like the plague. While the rabbit might prefer to find solace in their home during times of conflict, the sheep will often opt for the great outdoors. Either way, this Chinese love match will do almost anything to keep the peace, especially between each other. Unfortunately, this can sometimes lead to passive aggression within the goat, who although abhors conflict, also always prefers to get his or her way. Luckily for the Sheep, the rabbit is always aiming to please. They will end up conceding more often than not to the sheep’s wishes. Even in bed, the sheep will dominate over the rabbit sexually. Something that may hinder the Sheep and Rabbit friendship is their lack of reality. Both of these signs have the tendency to live in their respective fantasy worlds. And although these fantasy worlds may cross paths at times, when reality hits, these two may not know how to handle it. Problems with finances could be a very real issue for this Rabbit Goat couple, especially considering their need to retreat from any difficulties that arise. In addition, both Chinese zodiac signs don’t like to make decisions. One will have to step up in the relationship, otherwise they will end up going nowhere or doing nothing, which considering both of their temperaments, might not bother them at all. For this male rabbit and female goat love match to work well, they need to find another whose passions are similar enough, but ones that aren’t too similar or overbearing on the other. Otherwise you need to be ready for a breakup. They also cannot be too opposite, as both of these signs crave understanding from their partners. Yet, all in all, the rabbit and the goat make a quite the cooperative pairing. It should prove a success. 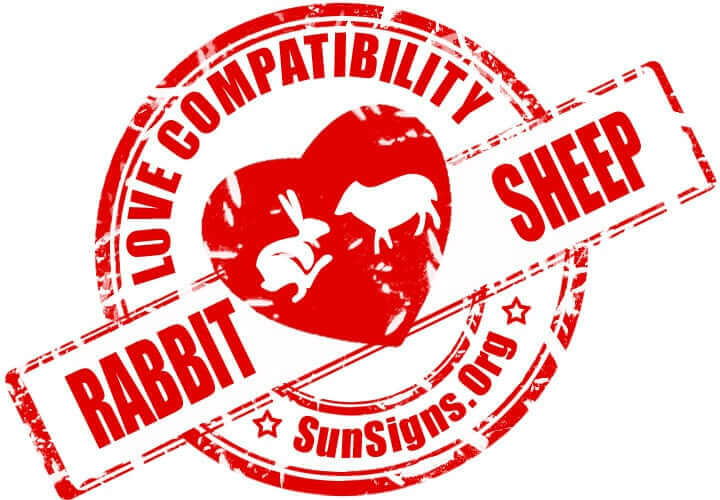 Rabbit & Goat Chinese Horoscope Compatibility Rated 5 Hearts! Next What Your Hair Color Says About You?